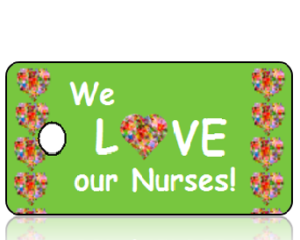 Love Key Tags by Share-IT! Tags. 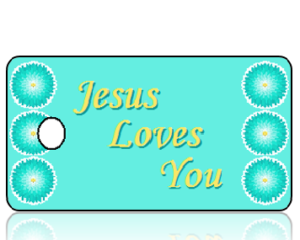 Pick from a large selection of designed Love Key Tags, and in addition you have the option to add a personalized message to the back of the Tags, for a personal touch. Quantity discounts available, for quantities over 2,500 Click here for quote. Give messages of inspiration, encouragement, also motivation, so as to lift up others, in the hope that they will reflect back on them in times of struggle as well as in times of need. 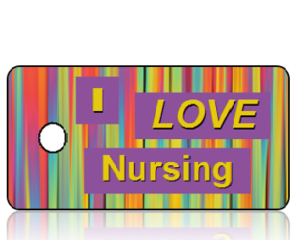 In order to encourage your team, design a Inspirational Key Tag with your Team Logo, because the building of a team will benefit all. Kids will benefit from Inspiration, for this reason Vacation Bible School, Blessings of the Backpacks, are perfect for first, second, third and fourth graders to collect, share and trade with friends! Actually, all school age children can benefit from Inspirational Key Tags, regardless of their grade. Inspirational words do have an effect, for this reason create your own specific Tag message. Above all, giving motivational support is a great give back, no matter who you have in mind. As another example, Parent’s could certainly benefit from uplifting Inspirational Key Tags as they face their challenges with raising children up. Connect to a Backpack with a sturdy carabiner. Tie one of our beautiful designs to a Gift. Furthermore, insert into a greeting card, for an added blessings. Put one in your Party Favors, they will love it! Use as a book mark. Get creative! Share your ideas with others on Pinterest or Facebook. Share-IT! 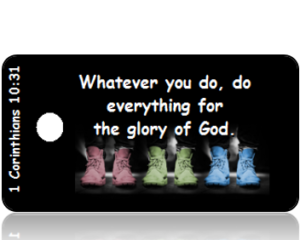 Tag customers not only want to share their favorite bible scripture verse. They also want to share memories, words of encouragement, bring teams together, celebrate, and provide motivational and inspirational messages. Our goal is to provide an economical way to reach out and share His Word, your positive message or memories to as many people as possible. As a result, we’ve developed a special keepsake, where you can easily have your message or special memories printed on an attractive key tag or bag tag. 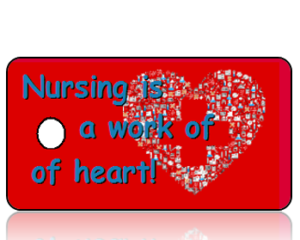 Your words of encouragement, inspiration and memories can be customized to express your specific message. Or, you can choose from a variety of predesigned tags and add a message on the backside, as a result delivering that special message you need! 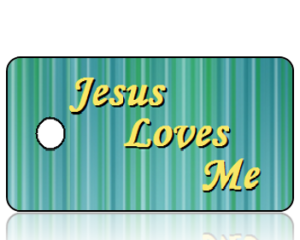 Additionally, our hope is these Love Key Tags are a blessing to you and those you may gift them to. Inspiration: influence to cause one to do or feel something, or be creative. All images and text are subject to approval. 1 Corinthians 10:31 Bible Scripture Tags - We must obey God rather than men. 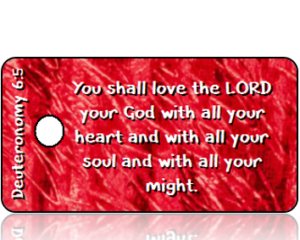 Deuteronomy 6:5 Bible Scripture Tags (ESV) - You shall love the LORD your God with all your heart and with all your soul and with all your might. 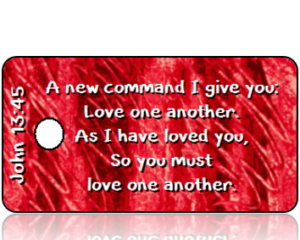 John 13:45 Bible Scripture Tags (NIV) - A new command I give you: Love one another. As I have loved you, So you must love one another. 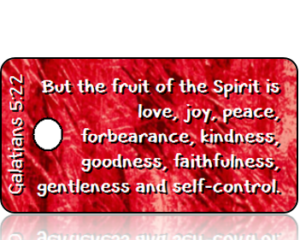 Galatians 5:22 Bible Scripture Tags (NIV) - But the fruit of the Spirit is love, joy, peace, forbearance, kindness, goodness, faithfulness, gentleness and self-control. 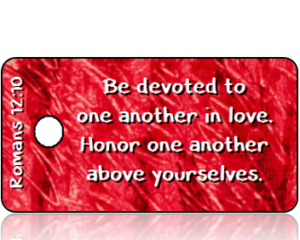 Romans 12:10 Bible Scripture Tags (NIV) - Be devoted to one another in love. Honor one another above yourselves. 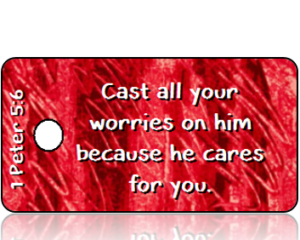 1 Peter 5:6 Bible Scripture Tags (NIV) - Cast all your worries on him because he cares for you. John 3:16 Bible Scripture Tags (NIV) - For God so loved the world that he gave his one and only Son, that whoever believes in him shall not perish but have eternal life.